Richard Nicholas Hair Studio is the best hair salon in Rittenhouse Square, Philadelphia offering hair service for women and men. Richard Nicholas offers diversity in haircutting. We offer expertise in razor haircuts and dry haircuts for women and men in Philadelphia. We also specialize in color services including, foiling, balayage, all over hair color, and double process blondes. Consultations are recommended for texture services, creative color, and corrective color services. We accept cash and all major credit cards for hair services. However we only accept cash gratuities. We require a minimum of 24 hours notice for all appointment cancellations. Please feel free to contact us for more information or questions. Since he first put a pair of scissors in his hand for a five-year apprenticeship, Nicholas Berardi Sr. has had a smile on his face. In 1971, he co-founded Richard Nicholas Hair Studio in Philadelphia, a place unlike any other barbershop, beauty salon or hair salon. The business soon began developing its own culture and style––one that defines independence. Watch the video to learn more. Richard Nicholas Hair Studio has been committed to the idea of independence. 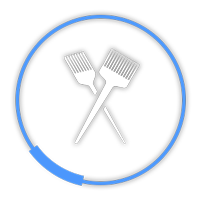 We have worked to create a culture of eclectic hairstylists from all parts of the world and facets of the Hair industry. Our highly trained stylists each have their own creative vision for you. At Richard Nicholas Hair Studio, you are guaranteed a world class service and look to emulate your individual lifestyle. For some it’s much easier to go along with the pack, but allow us to make your look truly independent.